The Film Development of the Philippines (FDCP) is calling for entries to the 1st National Film Competition in three (3) categories: Feature Film, Animation & Documentary to be represented by the 3 main regions of the Philippines, namely: Luzon, Visayas & Mindano. 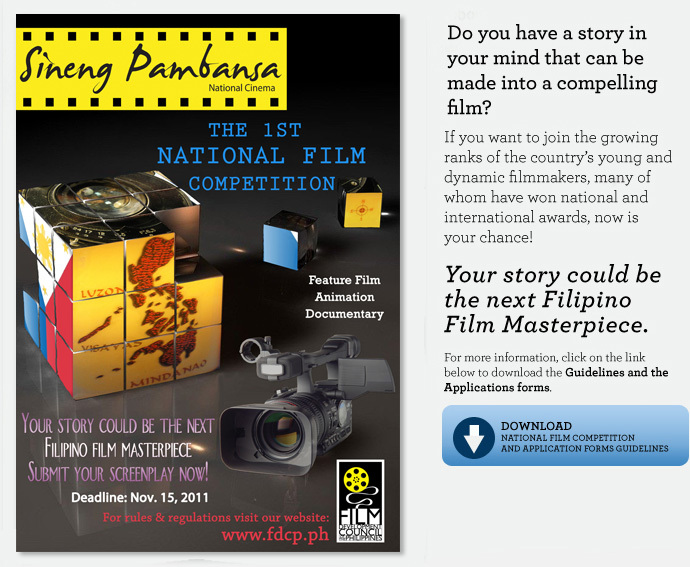 Deadline of submission is on November 15, 2011.
three (3) winners in the Animated Short Film Competition. The winners of the Feature Film Scriptwriting, Full-length Documentary, and Animated Short Film competitions shall be announced on December 20, 2011. The total amount of cash prizes is: PhP6,600,000. You can download the complete competition guidelines here.